FAZED BY FACEBOOK? TONGUE-TIED BY TWITTER? LOST ON LINKEDIN? LEARN HOW TO NAVIGATE THE SOCIAL MEDIA JUNGLE, AND FIND OUT HOW TO GET YOUR BUSINESS NOTICED. Social media is easy when you know how – this practical guide shows you how to get started, then refine and improve your strategy to get real business results. Many businesses know that social media is important – but they either haven’t made a start or are dabbling without a proper strategy in place. It’s easy to feel overwhelmed by the task – how much of my time will it take? When will I see the benefit? What do I do to get heard? How do I integrate it with my marketing and business goals? What are the risks? However given that 91% of adults use social media regularly, it’s a superb opportunity for you to find and engage with present and potential customers much more interactively than traditional marketing methods. 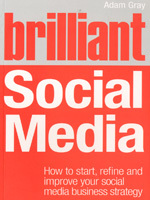 Brilliant Social Media will help you get started with social media, then refine and improve your experience with a series of sample straightforward steps that you can start to implement straightaway.